The Austin Shuffleboard Table is one of the finest shuffleboard tables made today with features not found on anywhere else. Available in 9′, 12′, 14′, 16′, and 18′ sizes to fit your room. 9-foot Austin shuffleboards are the shortest, but don’t think that being short will lessen its appeal! 9’ Austin shuffleboards fit better in smaller rooms, are the most affordable, and provide faster play than their longer counterparts. California House really delivers on their promise to provide completely personal, customizable shuffleboards. Even leaving aside the many different varieties of felts and finishes available to you with each California House product, the shining, gleaming surface of the tabletop shuffleboard playing field is reason enough to order one. 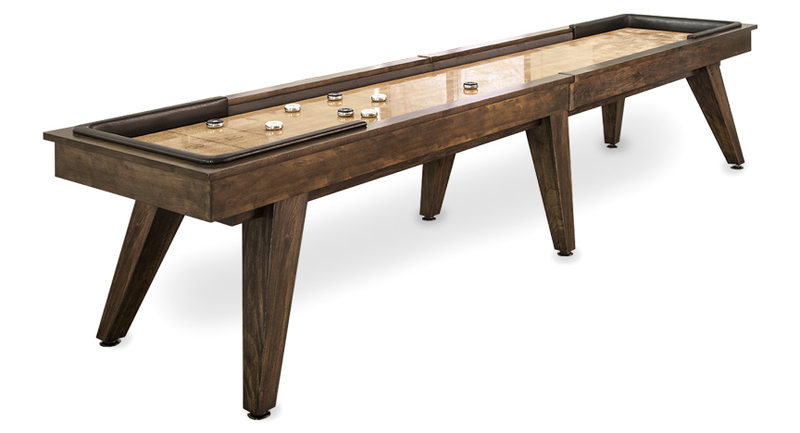 The Austin Shuffleboard has a solid 2.25″ thick tongue, and grooved beech wood play field with inlaid black walnut scoring areas. All quality-made in the USA. 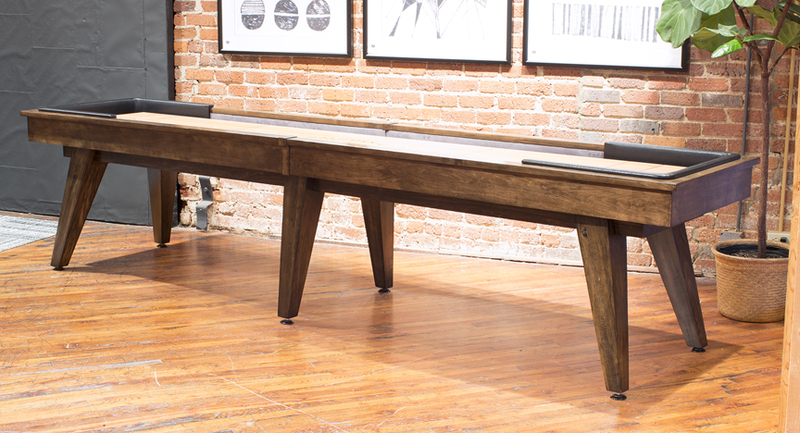 The Austin Shuffleboard Table is an original California House design. Solid 2.25″ thick solid tongue & grooved beech wood play field with inlaid black walnut scoring areas. Your game table will be delivered to the curb of your home for free, please have help ready to carry your game table from the curb of your home to the inside of your home. Basic freight means the freight company is not responsible for carrying the product into the building, unloading the package from the truck, or assembling your purchase. For heavier items, we strongly recommend you have the appropriate assistance available at the time of delivery. Local game table installers will arrive to your property to un-crate your game table, move it into the room of choice, install, level your table, and remove the few hundred pounds of packaging/shipping debris. 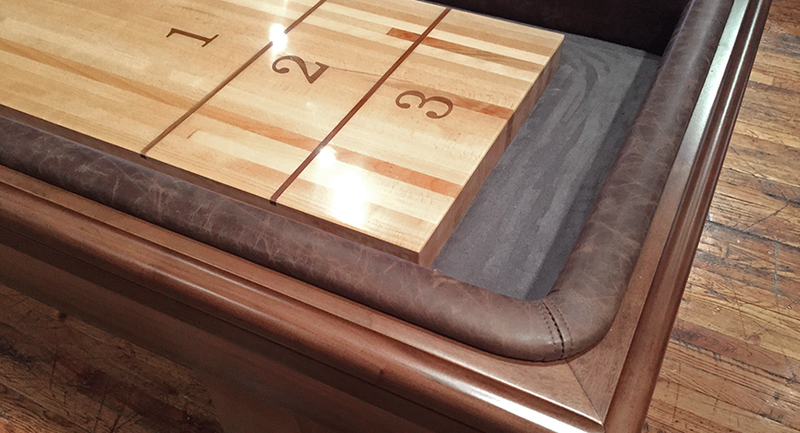 This option is ideal for those that want their game table professionally installed. The shipping company will notify you a few days in advance to schedule a time and date for delivery so please be sure to have a few strong people onsite to manually offload the table to pull into your garage for storage. Once on site notify us and we will coordinate our installers to come out to un-crate and set up the game table in the room of choice. Standard In-Home Installation is a worry-free way to have your new table installed. 1. California House boards start with a better lumber selection. Instead of maple playfields, California House makes it out of beech, which is 11% more rigid and 19% more shock resistant than maple. 2. Because beech is so stiff, California House was able to reduce the thickness of the playfield from 3" to 2.125" to allow for the proper concavity adjustment and playability of the boards. California House also double tongue-and-grooves (TNG) the planks for superior torsion strength and to allow for more glue surface between the planks. 3. California House playfields are balance-sealed and topped with a two-part poured polymer resin built to an average of 1/8" thick. The polymer we use resists yellowing and consists of 100% solids for a rock hard playing surface that will last. 4. California House Climate Adjusters (beneath the playfield) are designed for superior fine-tuning and strength. Climate Adjusters keep the playfield slightly concave and under tension for proper play throughout the year. California House uses a 1/2" diameter all-thread with 20 threads per inch so your installer can fine tune the playability of the board. Each 1/4" thick steel bracket is fastened to the board with 12 2" long screws that go almost all the way through the playfield. The Climate Adjusters are designed by California House and cut, welded, and powder coated in the USA. Climate Adjusters are incredibly important to the playability of the board. 5. As most fine woodworkers know, balancing a piece of wood is extremely important. That means whatever is on one side of the board should be on the other to balance the moisture exchange and keep warping to a minimum. This is no more important than on a shuffleboard playfield. California House uses the same two-part poured polymer resin on the bottom of the board as we do the top. Several applications are applied to the bottom to seal and balance the board properly. 6. 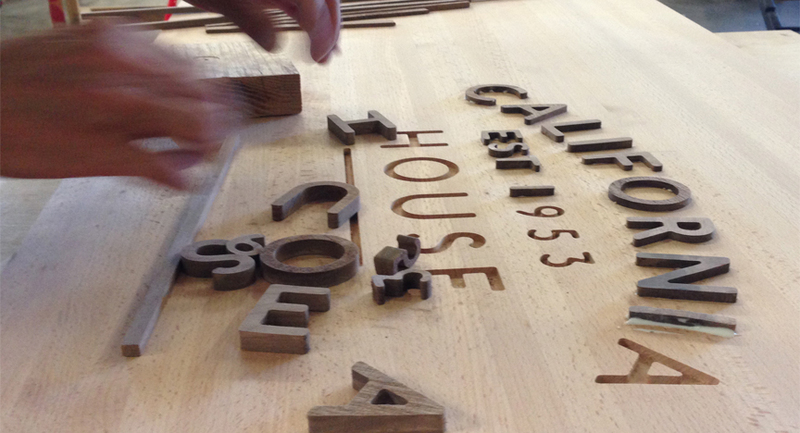 California House logo and scoring areas are not stickers that are applied to the wood and then sealed with polymer. California House inlays the playfield with black walnut. The best shuffleboards get the finest details. 7. Custom inlayed logos are available. 8. Perhaps the one detail that separates California House shuffleboard tables the most in the marketplace are the padded end collars. The decorative yet functional collars protect your cradle from the random flying weight (puck), gives you a perfect hand hold when shooting, and looks great. You get to choose from a multitude of colors of vinyls or leathers. 9. California House cradles are built like furniture meant to stand the test of time. Solid hardwood chassis and corner blocked cross rails with a hardwood veneer plywood cradle bottom. Legs are pre-assembled at the factory and easily mounted with 5/16" bolts into metal inserts for strength. The solid construction is another reason California House shuffleboard tables are considered to be the finest you can buy. Shuffleboards need a strong foundation to function well. Our heavy duty solid-hardwood construction ensures that the table will not budge or shift or creak under even the most spirited game. 10. California House lines the alleys (area around the playfield) of the shuffleboard tables with polyester microfiber upholstery fabric, not indoor / outdoor carpeting. Microfiber alleys let you pick from a wide range of colors, looks great, and is easier to clean than carpeting. 11. Finally, California House offers stylish, original designs that are on-trend yet feature timeless qualities. 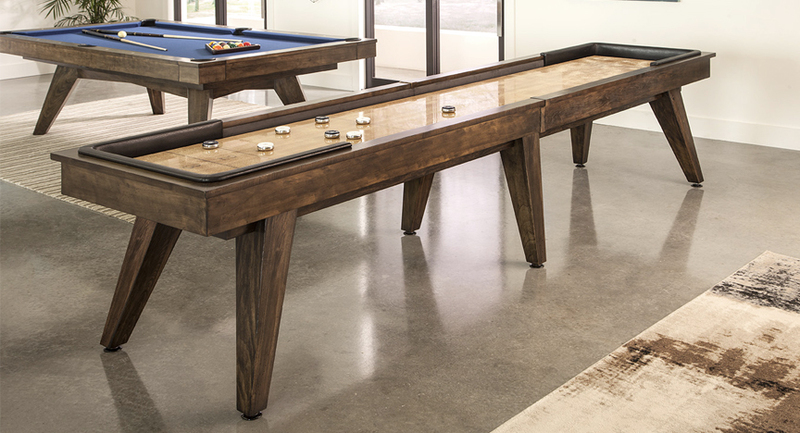 All Cal House shuffleboard tables are available in your choice of finish color, alley and collar upholstery, and are offered in a wide range of sizes. All Cal House products are made in the USA.